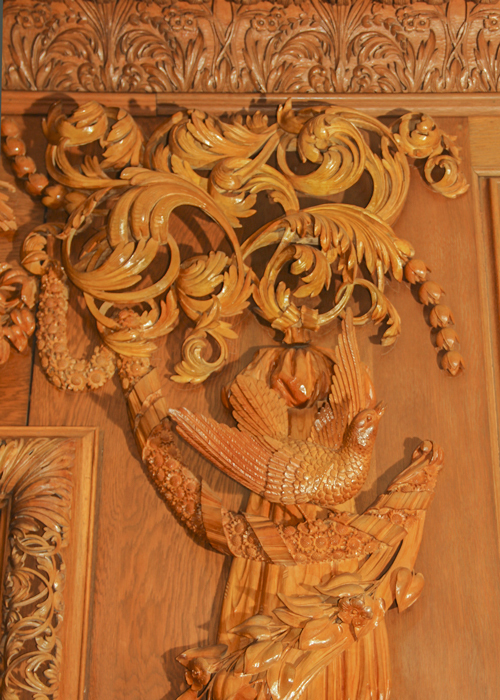 This is the first of three articles about the unique and distinctive wood carvings of Herbert Millard. 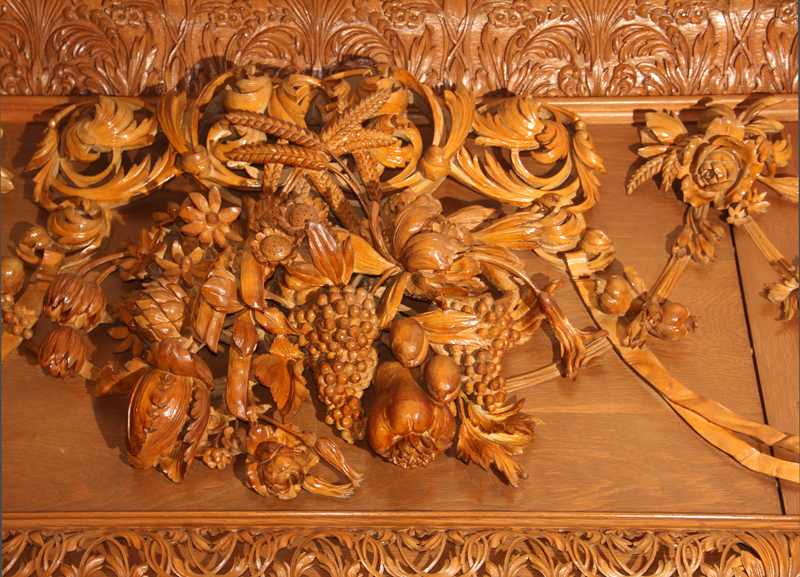 The second article is about other Herbert Millard Wood Carvings, and the third will be biographical about Millard. The Whitehead Memorial Room is a working meeting room deep in the administrative offices in the Whitehead Wing of Emory University Hospital. Lettie Pate Evans, formerly Lettie Pate Whitehead, funded creation of this room to memorialize her former husband and two sons; all three deceased at relatively young ages. The room was designed by legendary Atlanta architect Philip Shutze, as was the rest of the surgical wing of the hospital. 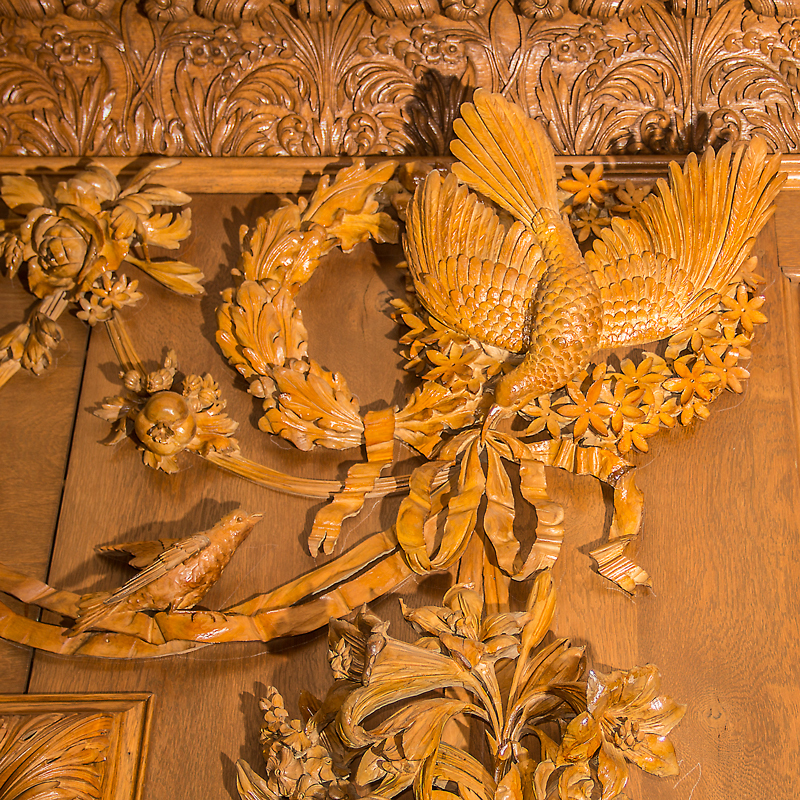 Master woodcarver Herbert Millard worked three years to create the stunning wood carvings that decorate this room. In all the room took four years to complete. 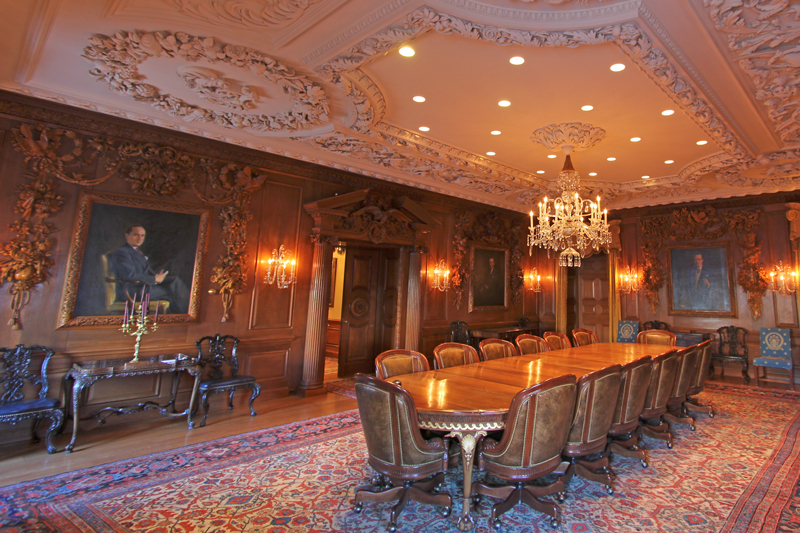 The Whitehead Room serves as the boardroom for hospital executive meetings and senior surgeons have the privilege of reserving it for whatever purpose they deem fit. Janet Smith, RN, MSN said that when she worked for Dr. Dean Warren in the 1980’s, then Chairman of the Emory Surgery Department, he used the Whitehead Room as a second office–which never failed to impress people who met with him there. The room is also used for holiday gatherings and special occasions, such as award presentations. Like the lush Doge’s Palace in Venice, it intentionally bestows an aura of importance, influence and, yes, power upon those who hold gatherings there. The Whitehead Memorial Room is not open to the public, and though it is not a secret, its existence is known to few people outside the hospital. Even within the hospital, only part of the staff know it exists. The executive office wing of the hospital where it is located is not staffed or organized to accommodate uninvited visitors. Entering the room is entering private office space, and should not be done without authorization. 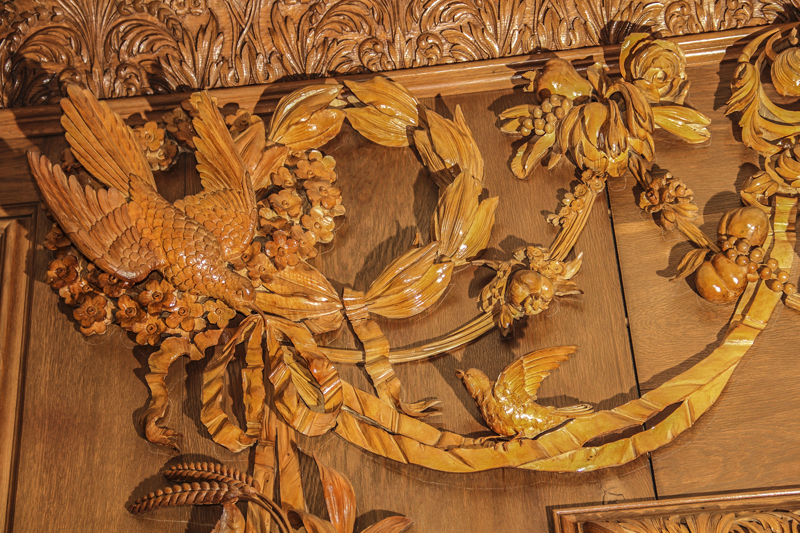 The walls of the Whitehead Memorial room are decorated with opulent wood carvings of great beauty. 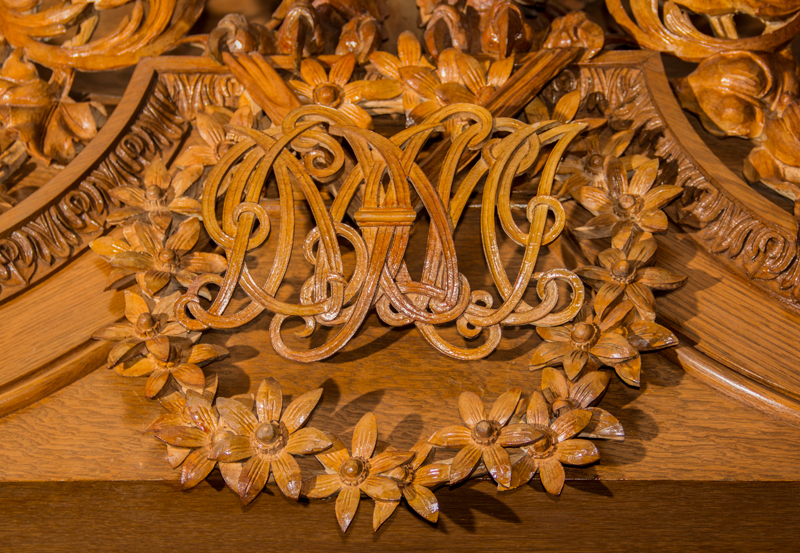 Master woodcarver Herbert Millard moved his family to Atlanta from Cincinnati so he could dedicate himself completely to this project. 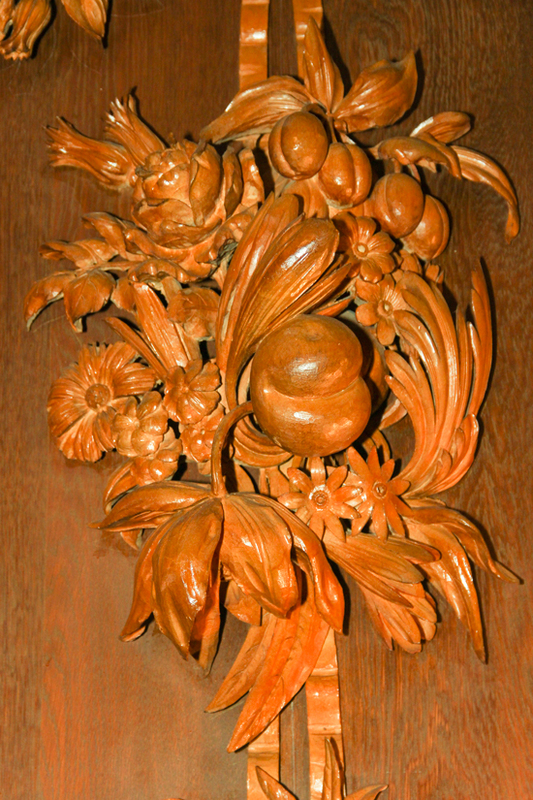 Millard’s woodwork is in the style of Christopher Wren’s carver Grinling Gibbons. 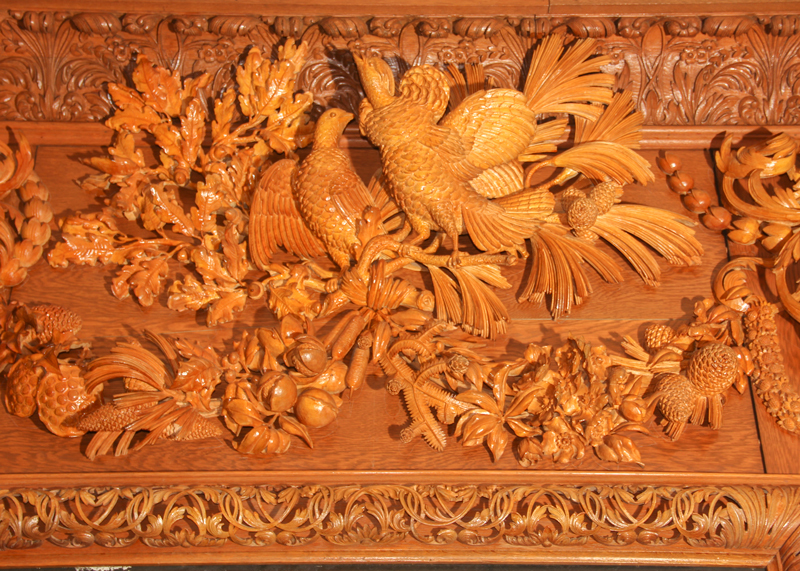 Millard’s carvings are dramatically and skillfully rendered. 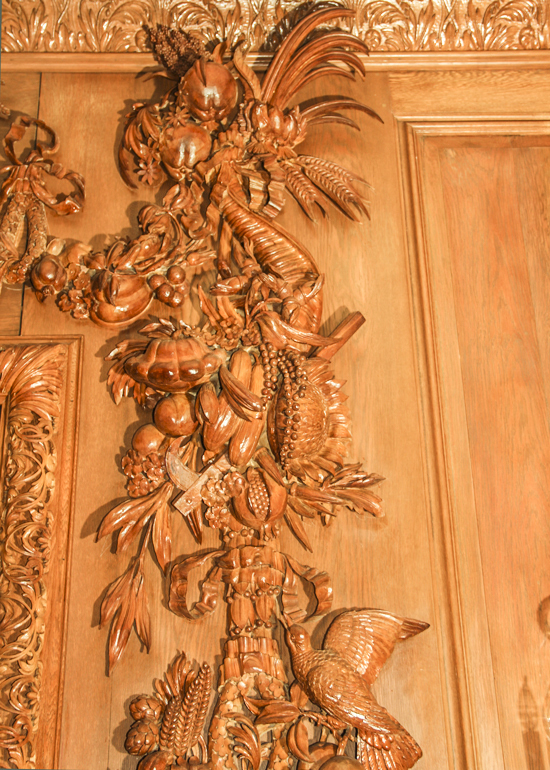 Some carvings stand out up to nine inches from the wall. 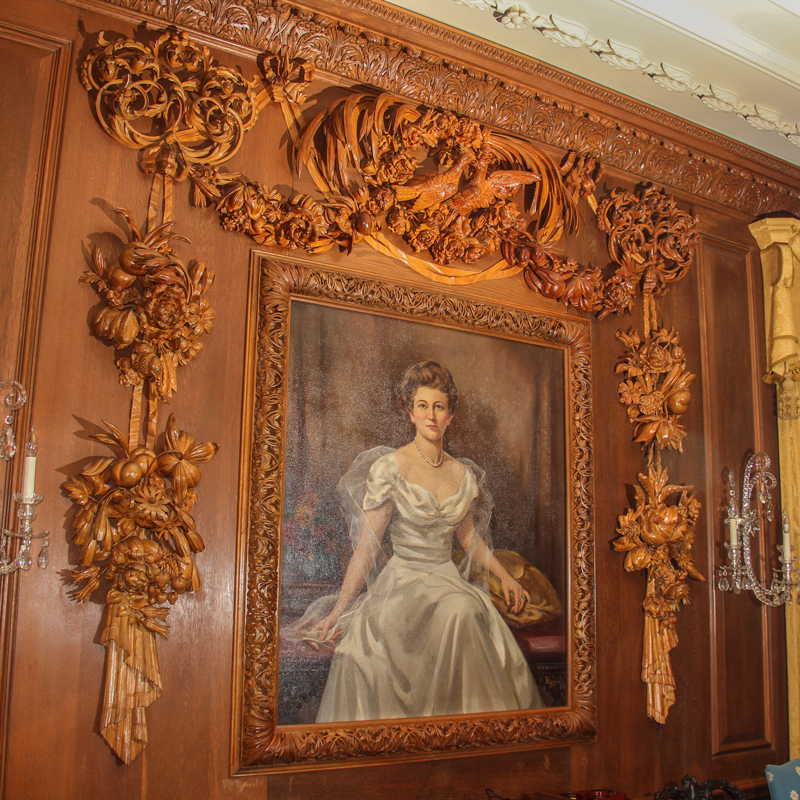 The room features painted portraits of Lettie Pate (Whitehead) Evans, her first husband, Joseph B. Whitehead, Sr. and their two sons, Joseph B. Whitehead, Jr., and Conkey Pate Whitehead. At the time of its construction in the mid-1940’s, only Ms. Evans was still alive, the men of the Whitehead family having died tragically young. Ms. Evans was only 34 years old when her husband, Joseph Whitehead Sr., died but she stepped up to the task of supervising her husband’s business interests. Ms. Evans wisely chose talented executives to manage the surging growth of her part of the Coca-Cola bottling business. 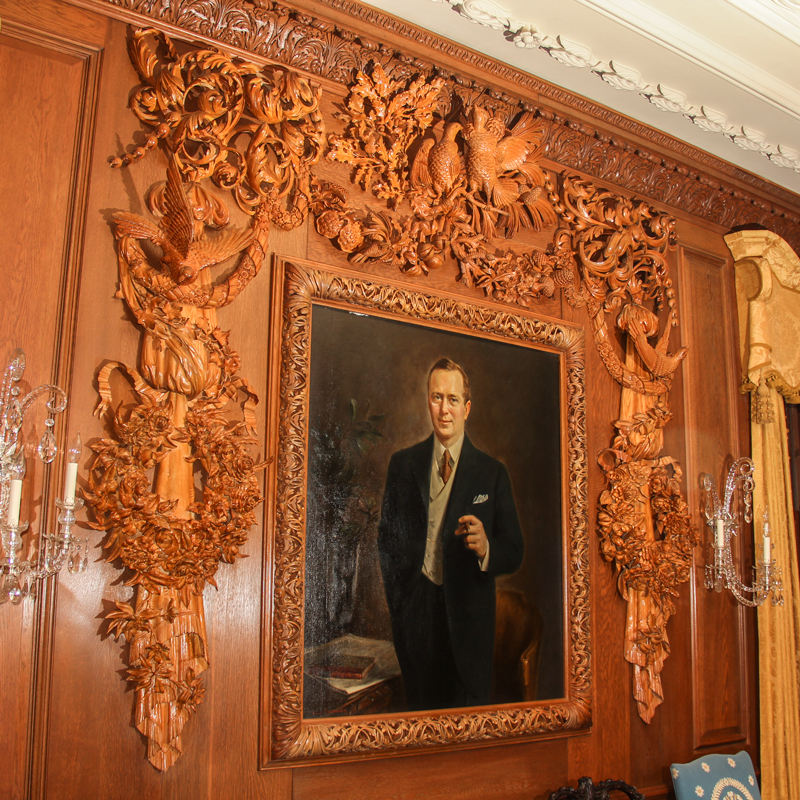 The innovations that Whitehead Sr. and his partners had put in place led to decades of record breaking success that created large personal fortunes for the Whitehead heirs. The soaring financial success of the early Coca-Cola bottling business was fueled by franchising bottling plants throughout the U.S. to eager regional entrepreneurs. In the mid 1930’s, Coca-Cola President Robert Woodruff purchased the bottling royalty rights from the Whitehead family and John Lupton for Coca-Cola common stock. This legendary transaction proved enormously profitable for all parties involved. Mr. Woodward admired Ms. Whitehead’s common sense and prudent nature and appointed her to the Coca-Cola Board of Directors in 1934, making her one of the first women to serve on the board of a major American corporation. She served in that capacity for twenty years. In 1899 Mr. Whitehead Sr. and his partner, fellow attorney Benjamin F. Thomas came to Atlanta from their home town of Chattanooga. They had managed to get a meeting with Coca-Cola’s owner and president, Asa Candler, through a family relation, and they presented him with their idea to bottle Coca-Cola. Prior to that time, Coca-Cola was only sold in syrup form which had to be mixed with soda water and served at soda fountains. It took some convincing, but Candler finally consented so long as Whitehead and Thomas agreed to guarantee the quality of the bottled drink and to honor all Coca-Cola’s labeling and advertising standards. Whitehead and Thomas were able to get exclusive bottling and sales rights to almost the entire United States, and they agreed to use only syrup from the Coca-Cola Company. When Whitehead went into the bottling business, he had little money of his own and sold half his interest to John Thomas Lupton for $2,500 to get started. From that modest sum, four great Whitehead/Evans fortunes grew, which eventually evolved into major charitable foundations. Whitehead and Thomas went their separate ways, opening up rudimentary bottling plants in Atlanta and Chattanooga, respectively, and soon divided US markets between them. Basically, Whitehead and Lupton took the South and Thomas took the rest of the nation, barring a few states excluded due to prior agreements. Their early bottling methods were crude–Thomas’ small plant used a foot powered pump to fill bottles. Early going was difficult but they kept at it. Then, at just the right time, a technological innovation changed everything. A big problem with bottling was the rubber bottle stopper in use at that time. It was difficult to seal and unreliable. In 1900 the metal bottle cap was invented, along with a simple and reliable way to attach it to a bottle. This allowed Whitehead and Thomas to build plants that were standard, mechanized, and productive. It enabled Whitehead, Thomas, and Lumpton to create what some have called the most dynamic franchising system in American business history. In 1906 Joseph B. Whitehead, Sr. developed a bad cold when he returned from an exhausting business trip. He went to his wife’s Virginia home expecting to rest and recover, but the cold turned into pneumonia and he died in just a few days surrounded by his family. He was 41 years old. Ms. Whitehead remarried seven years later to Colonel Arthur Kelly Evans, a retired Canadian Army Officer. They lived together for more than 30 years, until his death in 1948. The Whitehead Memorial Room is about 25 by 40 feet–roomy and comfortable but not overly large. 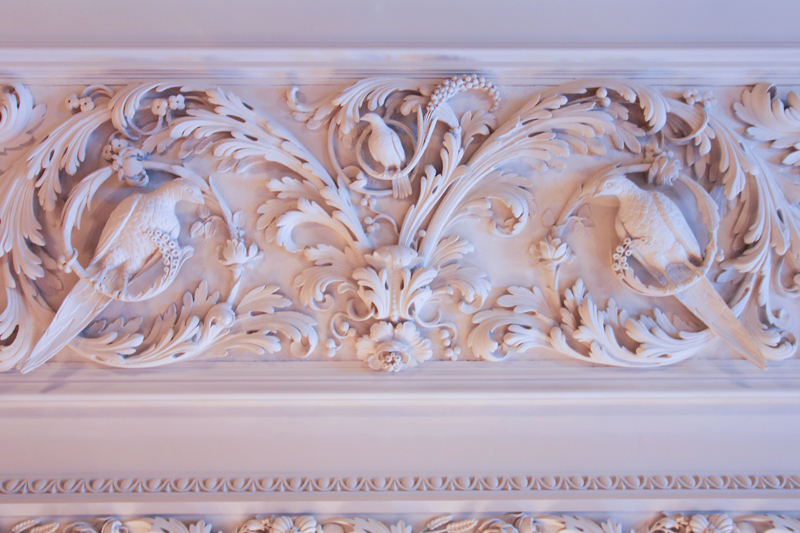 What appears to be crown molding is actually a cornice carved into solid oak beams. 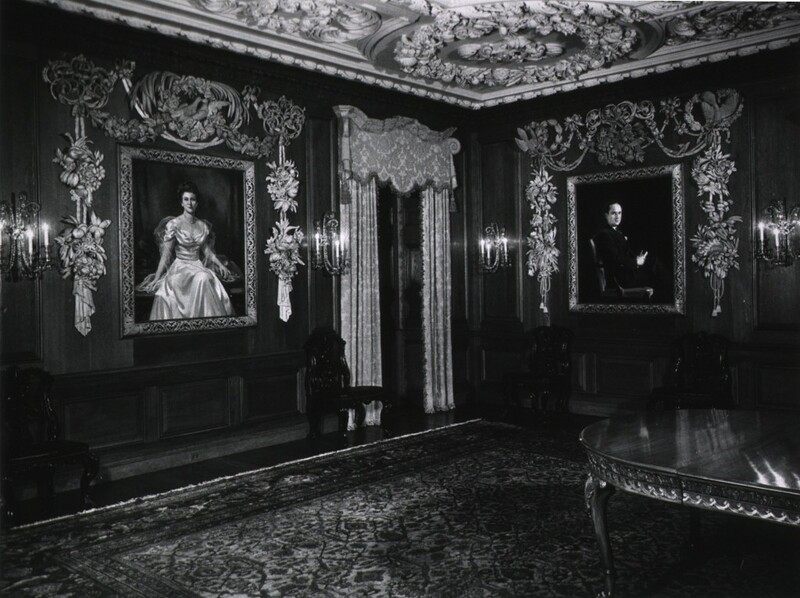 On the east wall is the portrait of Ms. Whitehead/Evans facing Joseph B. Whitehead, Sr.’s portrait across the room on the west wall, with portraits of their two sons between them on the south wall. 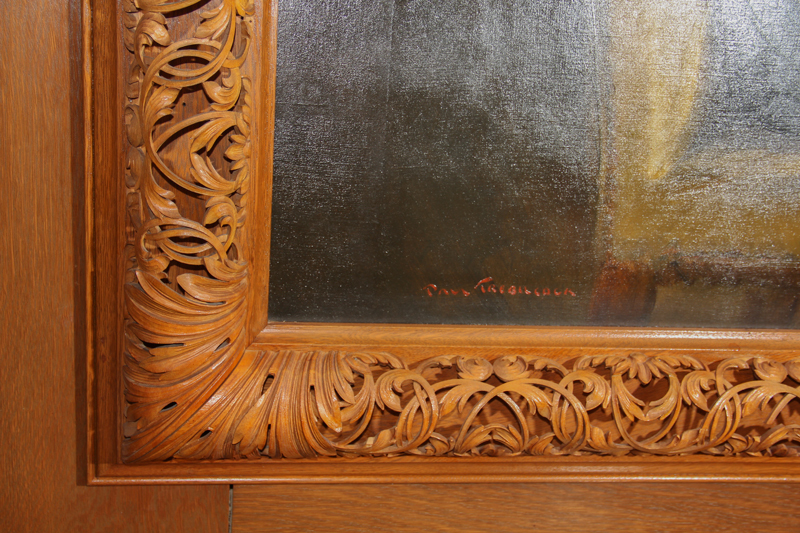 The frames around the portraits are “back-cut,” meaning they were carved from the back side to achieve a delicate hollowed-out effect before finishing touches were carved from the front. 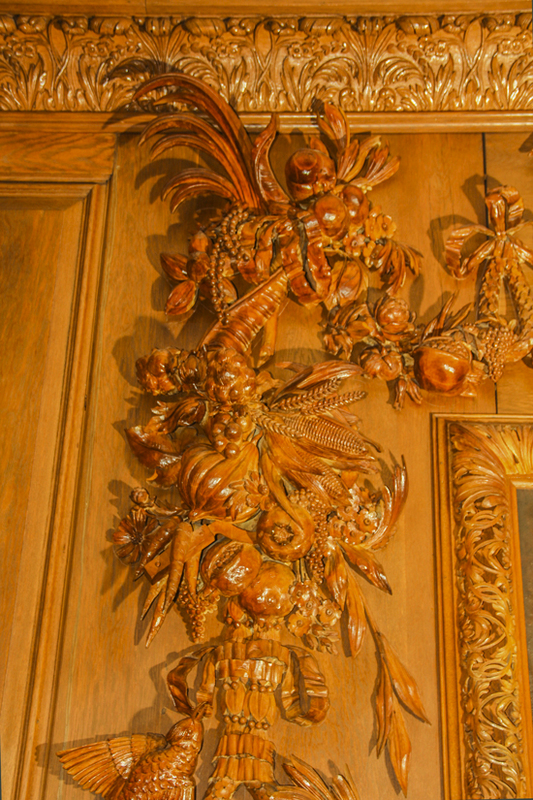 Superb garlands of linden wood surround each of the portraits. Each depicts one of the four seasons. The garland around Ms. Whitehead/Evans represents Spring. 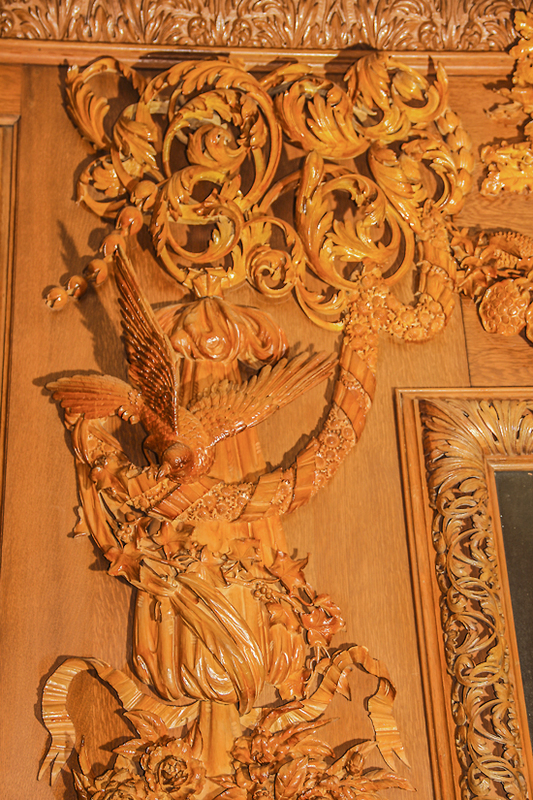 The bird on the right below seems to be pointing to the portrait of Conkey Pate Whitehead, Ms. Evans’ younger son, on the south wall. 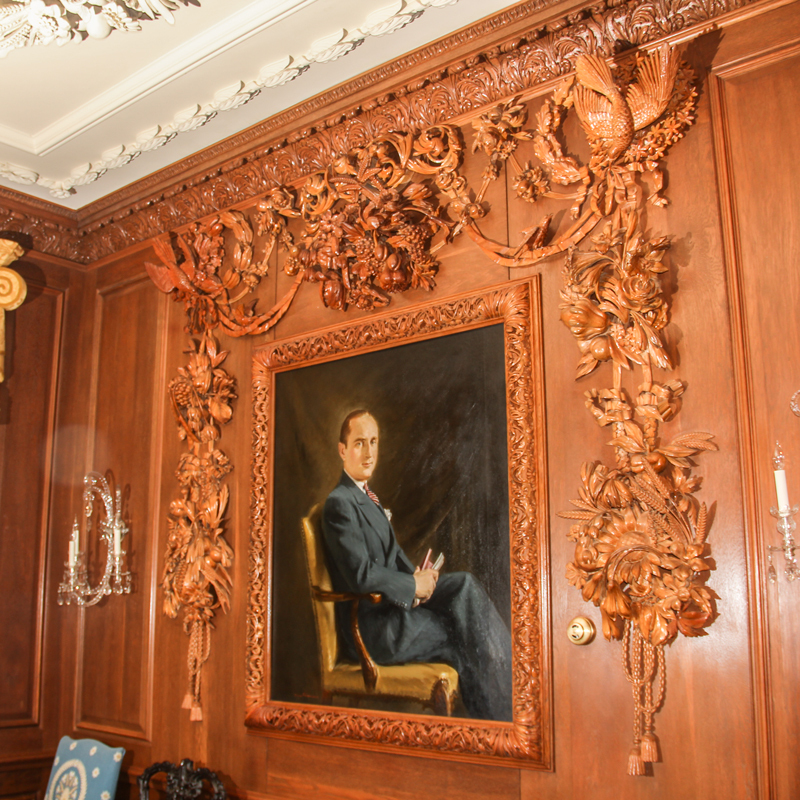 Initial funding for the Whitehead Memorial Room came from his charitable foundation. 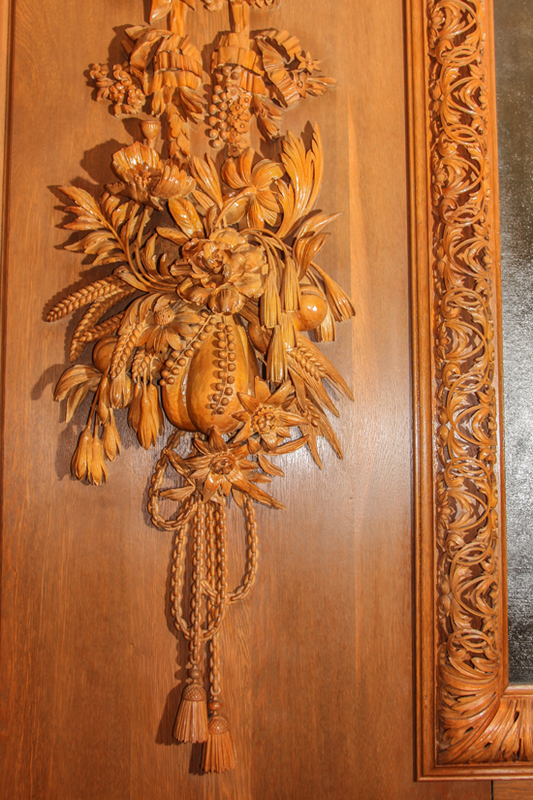 It is not known from current sources how much of the design of the wood carvings came from Shutze and how much from Millard, but the best example of their collaboration is the entry door and its surrounds. This doorway has elements of both Shutze and Millard. The Ionic columns and broken pediment are characteristic Shutze designs, whereas the menacing eagle, monogram, and related scroll work are distinctly Millard. In all, it is a powerful expression of interior architectural design. The fierceness of the eagle is tempered by the sprig of a vine it holds in its beak. 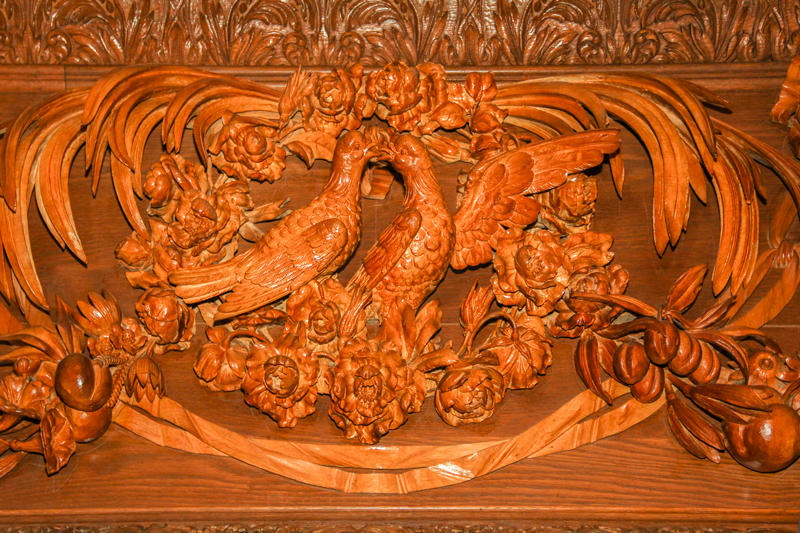 In her book on Shutze’s work, Georgia Tech Professor Elizabeth Dowling stated, “After Millard reviewed Shutze’s designs, he estimated the woodcarving would require over two years of his time (it actually took three years. 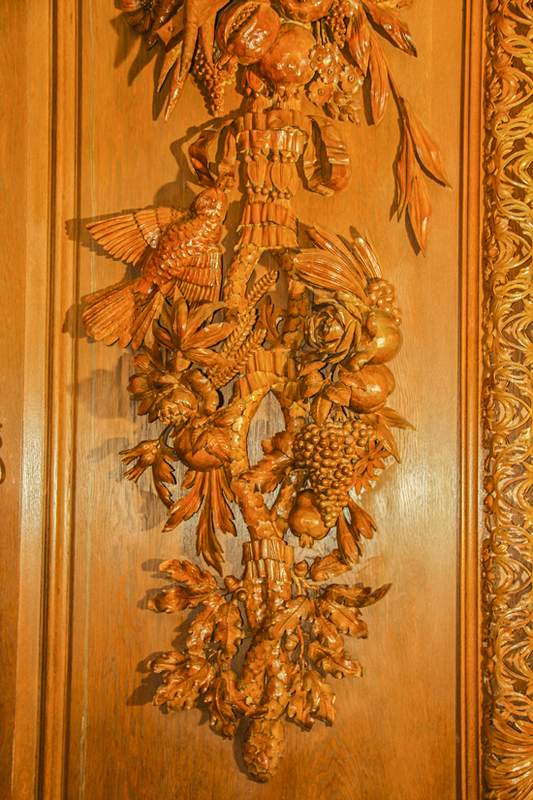 )”4 This implies that Shutze designed the woodcarvings at least conceptually to some degree, or perhaps in detail. 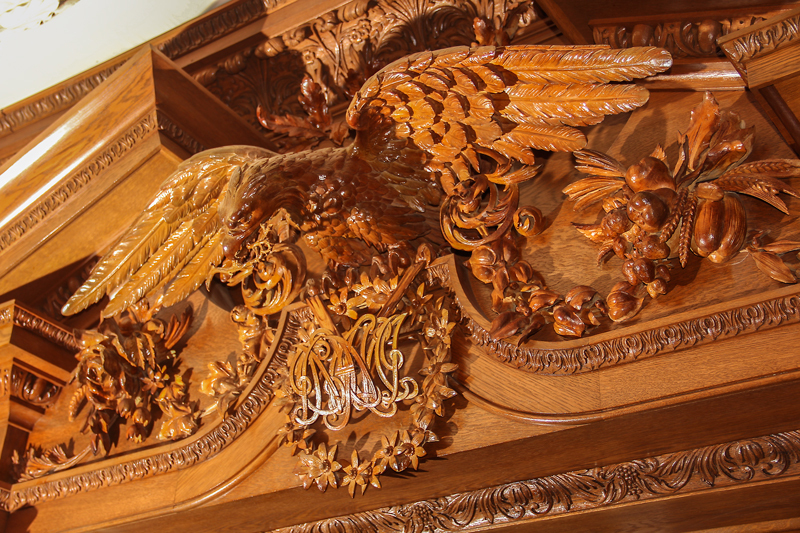 Beneath the eagle and centered above the door is a composite Whitehead monogram. 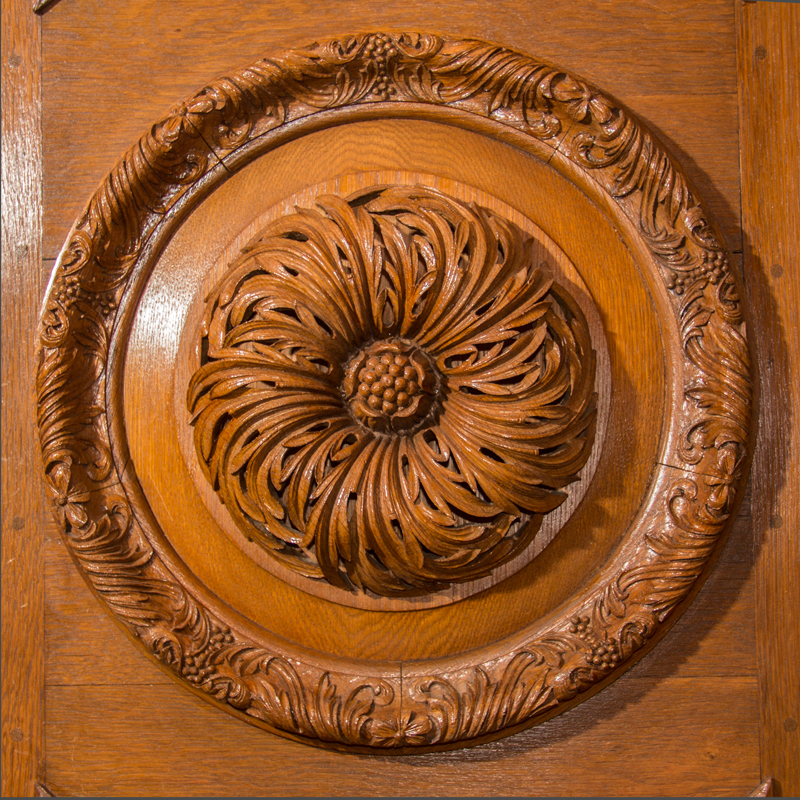 The finely executed rosettes on the doors are almost lost in the wealth of design and detail in this doorway. 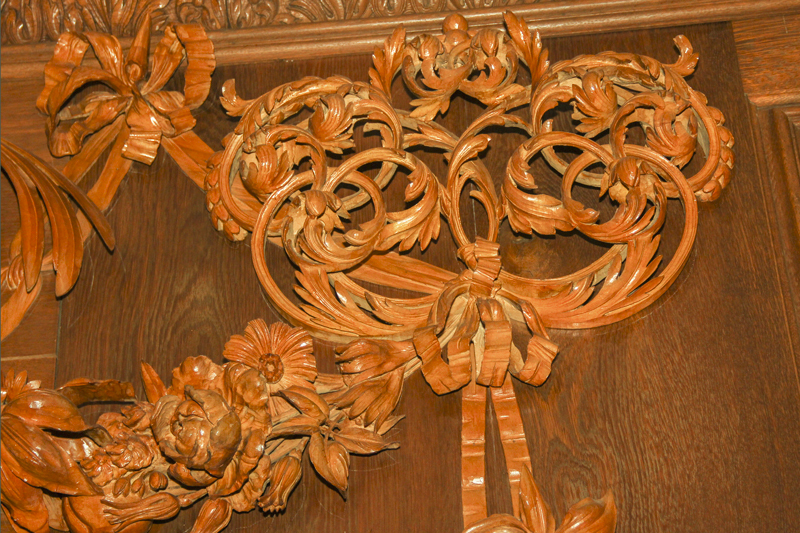 Here are details from the garland around Joseph B. Whitehead, Sr.’s portrait. 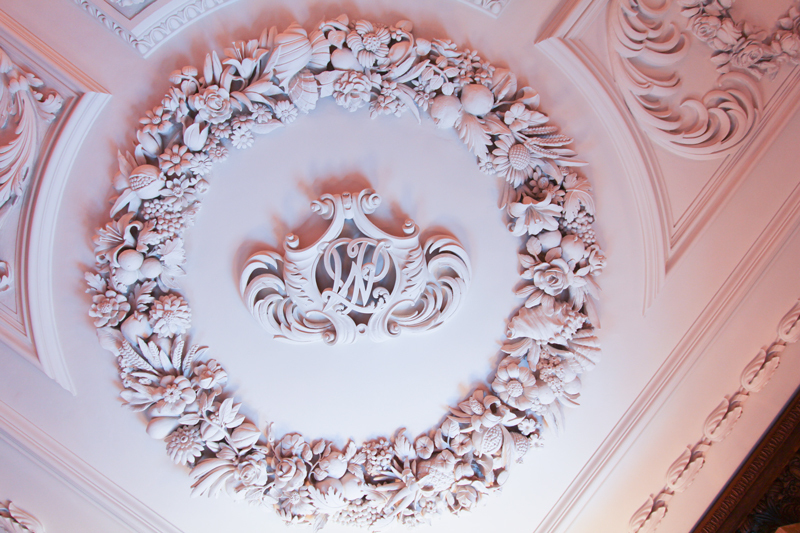 The sculpted plaster ceiling is a continuation of the masterful decoration. It was cast in more than 60 sections and lifted into place. 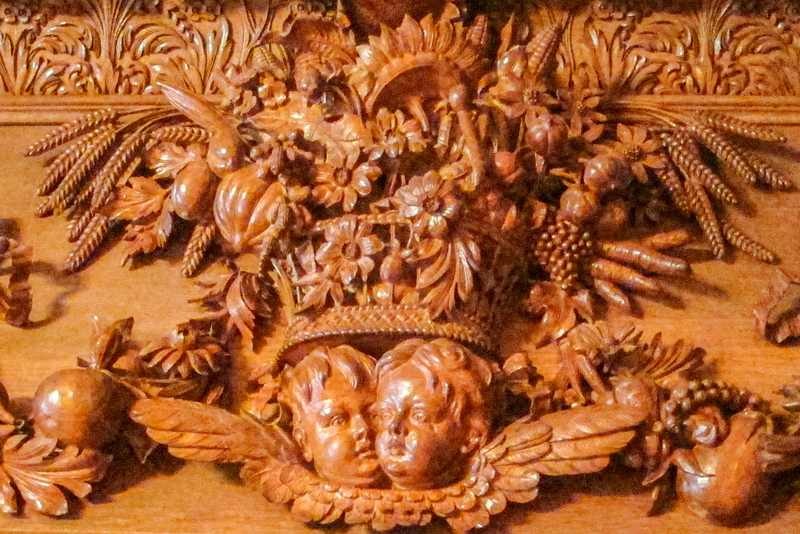 In each corner is a medallion that contains a monogram of one of the four family members. The monogram below reads LPW, for Letitia (Lettie) Pate Whitehead. The wealth of blooming flowers and ripening vegetation in the surrounding wreath is abundant and inventive. 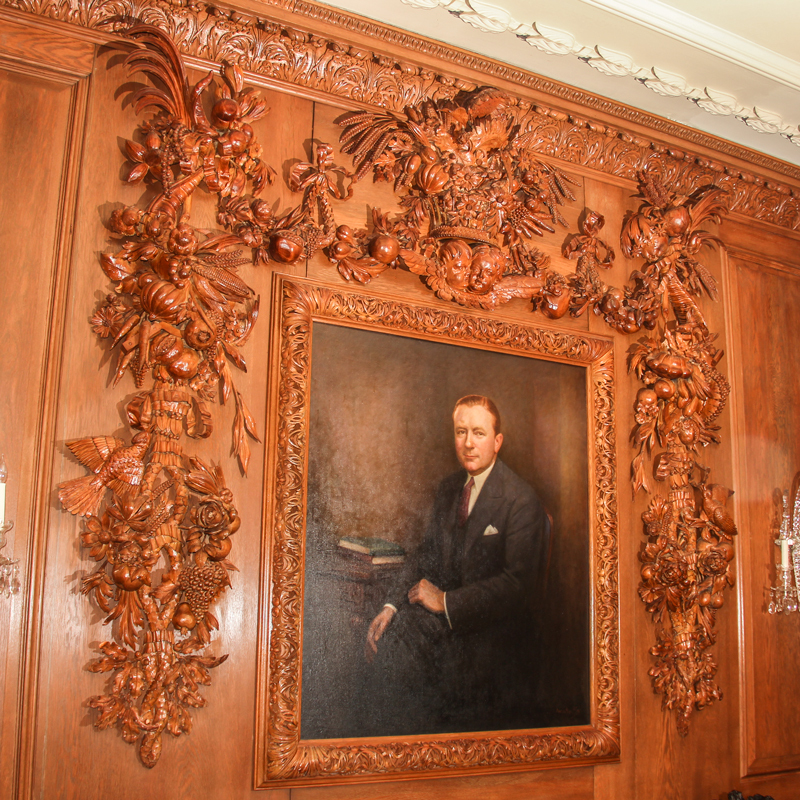 Joseph B. Whitehead, Jr.’s portrait is surrounded by carvings representing Autumn. There are mature kernels of grain, fruits and vegetables ready to be harvested as well as birds feeding. Mr. Whitehead, Jr. died in 1935 when he was just 40 years old. At his death his will transferred all of his assets to the Joseph B. Whitehead, Sr. Foundation in honor of his father. Whitehead, Jr.’s garland contains the only human figures anywhere in the room. They are the faces of two children supported by feathery wings. The figures are almost certainly the two sons, Joseph Jr. and Conkey Pate. This is probably naturalist rather than religious symbolism, for there are no other religious symbols to be found anywhere in the room. 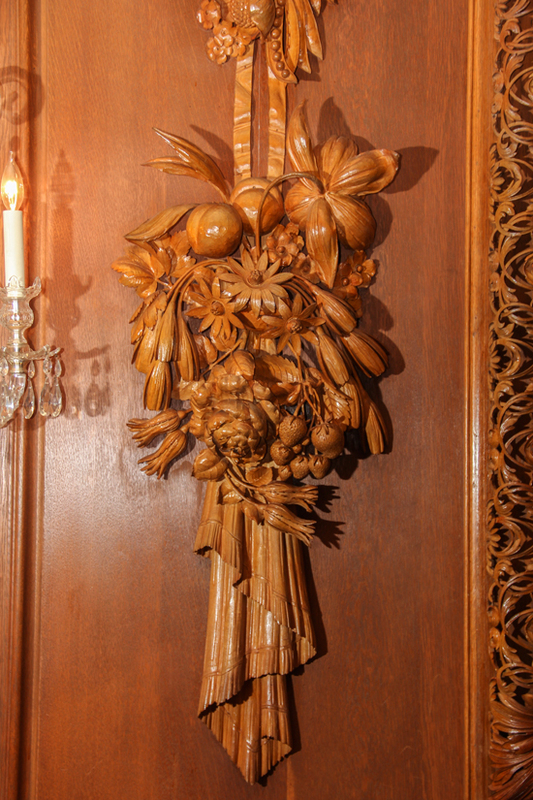 This in turn is curious, because Lettie Pate, who commissioned the room and at some level must have approved of its designs, was a lifelong active member of the Episcopal Church which she also supported with her charitable giving. Conkey Pate was the younger Whitehead son. He died in 1940 at the age of 43. His will provided for the establishment of a charitable foundation in honor of his mother. Ms. Whitehead/Evans dedicated the Emory Hospital Surgical Pavilion to Conkey as well as the Whitehead Memorial Room. The garland surrounding his portrait contains plants and birds from the growing season of Summer. It is 70 years since the Whitehead Memorial Room was constructed, and it has gained importance in another dimension; time. Emory University Hospital has maintained it to the highest standards and it shows little sign of deterioration. Added to the original effect of grandeur when the room was entered in the 1940s, is now the effect of stepping back in time. Would anyone commission a memorial like this today? Would anyone have the skill to carve it? 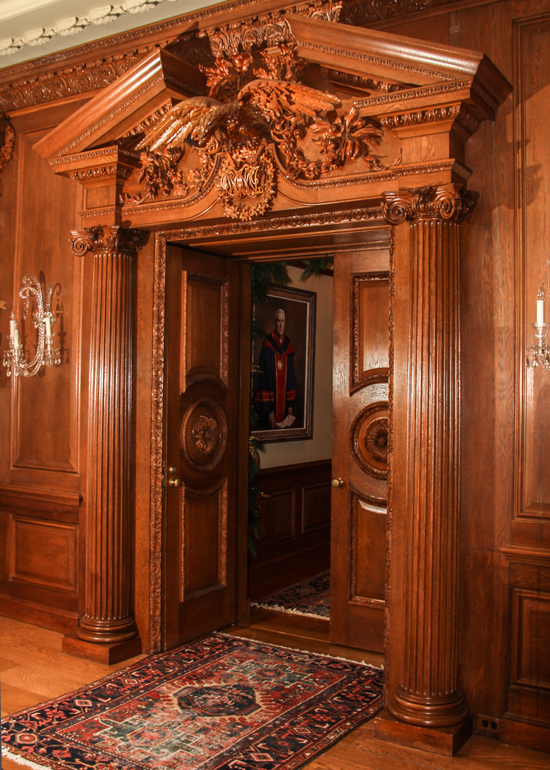 The Whitehead Memorial Room is a private, exclusive space that only a limited number of privileged people may enter. Many grand, private homes and rooms have been made more accessible to the public in recent years. Perhaps Emory University Hospital will find a workable way to allow more people to see this treasure of Atlanta art, architecture, and history. The primary sources for the information in this article are three brochures available from the Emory University Hospital staff. These brochures were offered to visitors to the room as souvenirs and to answer common questions. They are at most 12 pages long, are not dated, and do not list an author. They are titled as being from Emory, Emory Healthcare, or Emory University Hospital.